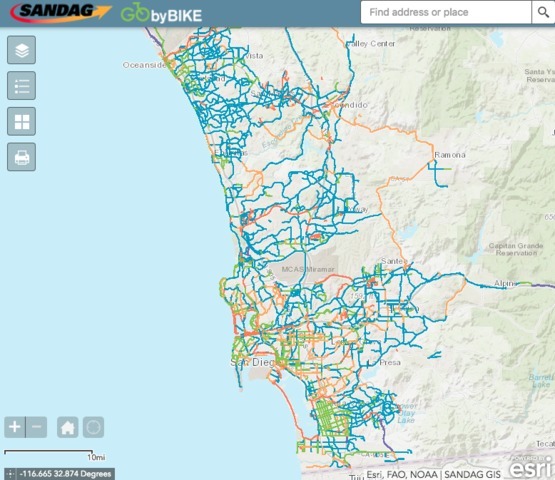 SAN DIEGO -- As part of an initiative aimed at expanding San Diego's regional bike network, SANDAG has released a map of bikeways throughout the county. The plan, known as GO by BIKE, proposes a bike system of interconnected corridors, support facilities and programs that make biking a convenient form of travel. According to Keep San Diego Moving, making the region more bike-friendly resolves issues like traffic congestion, air quality and livability. The plan proposes a network of bike corridors that will allow residents to bike on more direct routes within and between major destinations and activity centers. The plan also supports the implementation of SANDAG’s regional comprehensive plan and SANDAG’s 2050 regional transportation plan. To promote the infrastructure, SANDAG is putting on Bike to Work Day , which will take place on Thursday, May 17. The plan also has a $200 million early action program. The program comprises roughly 40 projects totaling about 77 miles of new bikeways designed to enhance neighborhood connections to schools, shopping and parks as well as transit stations.